To prepare for the forthcoming Christmas 2014 and to get into the festive spirit, Pali HQ has decided to undertake a mince pie competition! The aim is to compare mince pies from different shops on the high street and determine which mince pie was the best and deserved to get the honour of being eaten on Christmas Day! 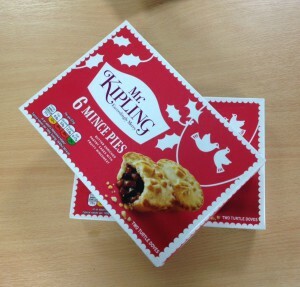 We have also tested mince pies baked in store by Asda which were very nice but the competition was sabotaged and the majority of the mince pies were not tested by the selected Pali members but were pinched by some of the male apprentices! Unfortunately the score (which was very high) had to be ruled out but have no fear, Pali are here and we are dedicated to testing more mince pies in the coming weeks so please look out for our next edition of the Mince Pie Competition! Pali Ltd – bringing you the best conveyancing searches known to man and comparing mince pies to ensure your Christmas has no disappointments in the food department!